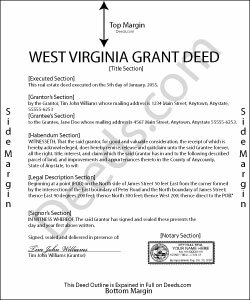 In West Virginia, title to real property can be transferred from one party to another using a grant deed. A statutory form for conveying real property is codified at West Virginia Code Section 36-3-5, with room to customize the form as needed for the situation. Typical covenants of a grant deed include that the grantor has not previous sold the interest now being conveyed and that the premises are free from encumbrances, excepting those noted in the instrument. Statutory covenants are codified at W. Va. Code 36-4, and require specific language in the body of the deed. To be valid and to provide a quality public record, the section of the deed that details the words and terms of conveyance (granting clause) must name both the grantor and grantee. It also includes a legal description detailed enough to identify the specific parcel within its district. The granting party must sign the deed in the presence of a notary public. Property owned by a married person requires the spouse's signature to release potential marital rights, regardless of whether the spouse holds a direct interest in the property. Deeds in this state are void as to creditors and subsequent purchasers for valuable consideration without notice until it is recorded in the county where the property is located (W. Va. Code 40-1-9). In other words, record it or it didn't happen. To record a grant deed with a county clerk in West Virginia, the instrument must meet state and county requirements of form and content for documents pertaining to an interest in real property. Deeds recorded in West Virginia are subject to a transfer tax based on the purchase price (consideration) listed on the deed, or, if no consideration is listed, the fair market value of the property. Transfers with no consideration require a Declaration of Consideration or Value. All recorded deeds must be accompanied by a Sales Listing Form. If the grantor is not a West Virginia resident, tax withholding pursuant to W. Va. Code Section 11-21-71b is also required. Consult a lawyer with questions about grant deeds, or for any other issues related to real property in West Virginia. Maricarol F. said: Found the site very easy to use. My fault I did not answer back right away. What was found is almost what I needed... Thanks. Reply from Staff: Thank you for the feedback Maricarol, we really appreciate it.